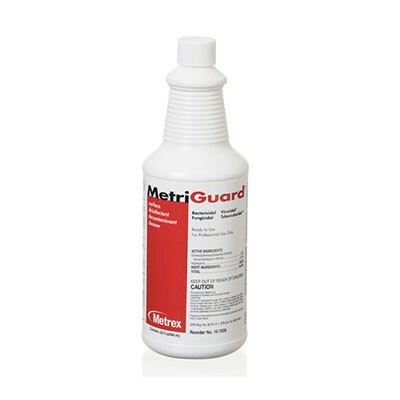 Metrex Metriguard Surface Disinfectant 10-7506 is one of the most effective, ready to use, multipurpose intermediate level surface disinfectants. It is effective against TB, HBV, viruses (hydrophilic and lipophilic), bacteria (including MRSA and VRE) and fungi; and is safe and compatible for use on the surfaces of inanimate objects. Especially useful in hospital operating rooms, emergency departments, isolation areas, neonatal units, laboratories and other critical care areas. For more information on Metrex Metriguard Surface Disinfectant 10-7506, please visit www.metrex.com. To view more technical details, please view the provided PDF. Metrex Research (Metrex) works to provide value-added consumable products and services in global healthcare environments. We offer a complete line of high-quality enzymatic detergents, high-level disinfectants/sterilants, surface disinfectants for use in hospitals, liquid medical waste disposal products, hand hygiene products, eye shields and MRSA infection prevention products. Our products are specifically designed for healthcare markets such as acute care, primary care, ambulatory surgery centers (ASC), EMS/Fire/Police, extended care, and the public sector.